KARSA (ISSN 2442-3289 and e-ISSN 2442-4285) is a peer-reviewed national journal published by Institut Agama Islam Negeri Madura. It has been nationally accredited (online) since April 26, 2017 by Ministry of Research Technology and Higher Education of Republic Indonesia. It is published twice a year (June and December). It publishes articles of research results, applied theory studies, social and Islamic culture issues. The aim of KARSA is to disseminate cutting-edge research that explores the interrelationship between social studies and (including) culture. The journal is multidisciplinary in scope and seeks to provide a forum for researchers interested in the interaction between social and cultural aspects across several disciplines, including anthropology, sociology, politics, law, linguistic, and environmental studies. The journal publishes quality, original and state-of-the-art articles that may be theoretical or empirical in orientation and that advance our understanding of the intricate relationship between social science and culture. New KARSA accepts manuscript with a different kind of languages are Indonesian, English, and Arabic. Each KARSA's manuscript is citeable using the date of the manuscript's first online posting and the DOI (Digital Object Identifiers). Unique DOI are assigned to all KARSA content for use on digital networks and the metadata associated with that content is registered with the DOI foundation. 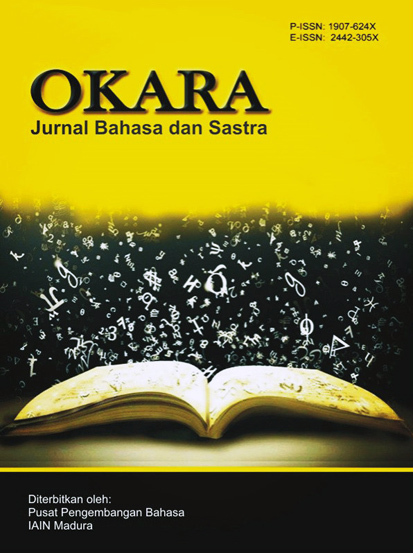 OKARA: Jurnal Bahasa dan Sastra or Journal of Languages and Literature (ISSN 1907-624X and E-ISSN 2442-305X) is a peer-reviewed journal published biannually by Pusat Pengembangan Bahasa [Center of Language development] of Institut Agama Islam Negeri (IAIN) Madura. The journal publishes research paper in the field of linguistics, literature, and language teaching, such as fundamental of ELT, the sound of word of language, structure, meaning, language and gender, sociolinguistic, language philosophy, historical of linguistic, origin/evolution, experimental linguistics, phonology, syntax, endangered minority language, language and nature, communicative strategy of teaching, linguistic anthropology, psychology of language, field methods in linguistic, interactive of language teaching. This journal is an open access journal which means that all content is freely available without any of charge to the user(s) or his/her institution. Users are allowed to read, download, copy, distribute, print, search, or link to the full texts of the articles, or use them for any other lawful purpose, without asking prior permission from the publisher or the author. OKARA has become a Crossref Member since 2015, therefore all articles published by OKARA will have unique DOI number. OKARA is already evaluated in Arjuna and it has been nationally accredited (Sinta 3) by the Ministry of Research Technology and Higher Education of Republic Indonesia based on SK No. 10/E/KTP/2019. Nuansa: Jurnal Penelitian Ilmu Sosial dan Keagamaan Islam (ISSN 1907-7211 and Online-ISSN 2442-8078) is published biannually by centre for research and community service (P3M), Pamekasan State of Islamic college. It is published on June and December. 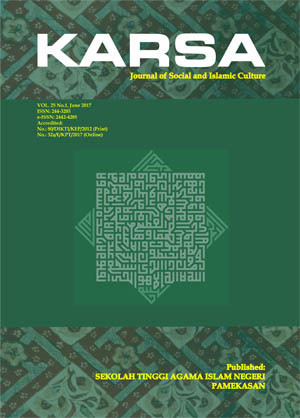 The journal put emphasis on aspects related to social and Islamic studies, with social reference to culture, politics, society, economics, education, history, and doctrines. Journal Nuansa has been indexed by Crossref since 2016. Therefore, all articles have unique DOI number. Tadris: Jurnal Pendidikan Islam (Print ISSN 1907-672X; Online ISSN 2442-5494 DOI: http://doi.org/10.19105/tjpi) is accredited by the Ministry of Research, Technology and Higher Education Republic of Indonesia Number 21/E/KPT/2018, has been published by the Tarbiyah Department of State College of Islamic Studies Madura. 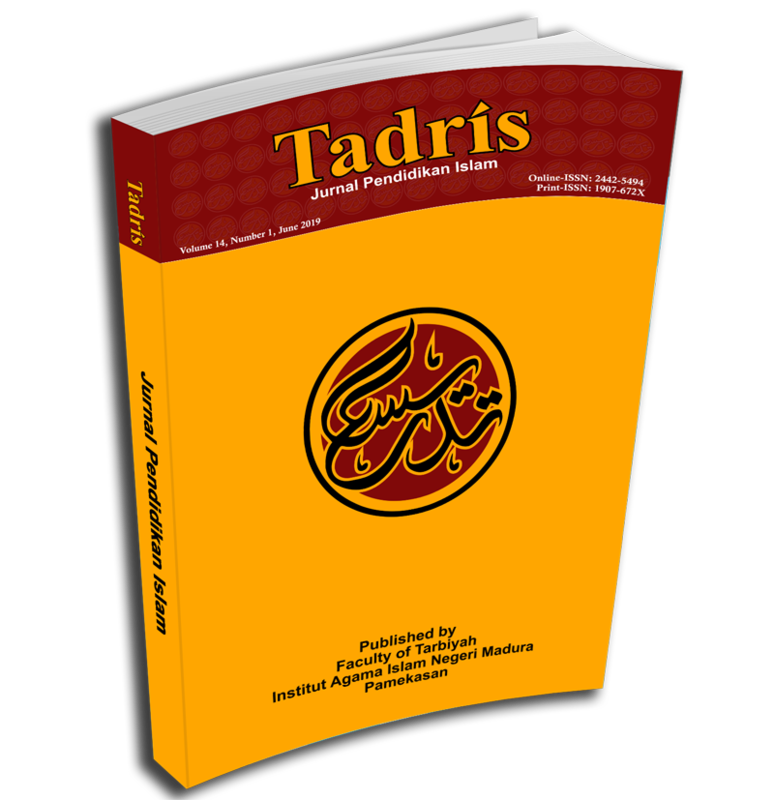 Tadris Journal is published twice a year in June and December, the contents are scientific writings on Islamic Education in forms of conceptual ideas, literature review, practical writing, or research results from various perspectives. All articles published in the Tadris Journal would be added with a DOI CrossRef Unique Number.The editors invite scholars, lecturers, and researchers to participate in writing articles in our journals. Articles must be original and have never been published. The script is typed in 1 cm space, A4 paper size, and 20-25 pages length of writing (here) for further detail or (here) for Journal Template. 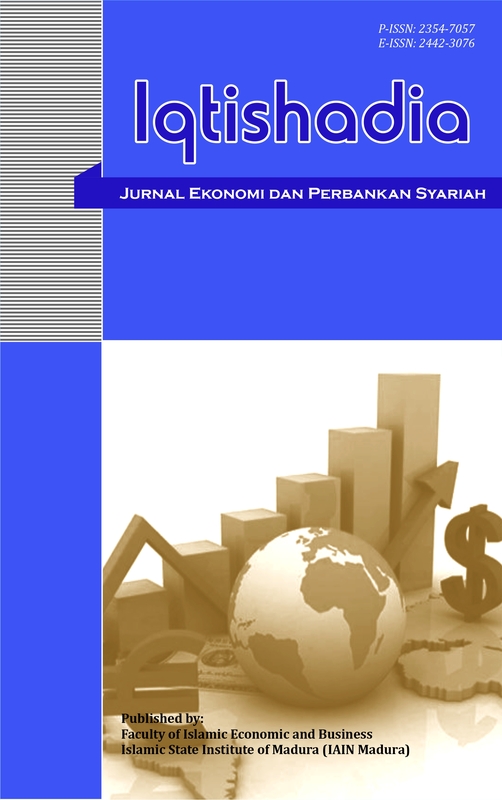 Iqtishadia: Jurnal Ekonomi dan Perbankan Syariah (Print ISSN 2354-7057; Online ISSN 2442-3076) has been published by the Department of Economics and Islamic Business of State Islamic Institute of Madura (IAIN Madura). Iqtishadia Journal is published twice a year in June and December, the contents are scientific writings on Economics and Islamic Banking in forms of conceptual ideas, literature review, practical writing, or research results from various perspectives. All articles published in the Iqtishadia Journal would be added with a DOI CrossRef Unique Number. The editors invite scholars, lecturers, and researchers to participate in writing articles in our journals. Articles must be original and have never been published. The script is typed in 1.5cm space, A4 paper size, and 20-25px length of writing (here) for further detail. 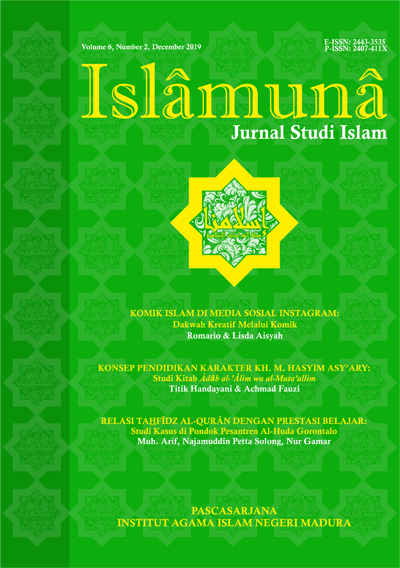 Islamuna: Jurnal Studi Islam (ISSN: 2407-411X; E-ISSN: 2443-3535) is a double-blind peer-reviewed journal published binnually by Postgraduate Program of Madura State Islamic Institute (Pascasarjana Institut Agama Islam Negeri (IAIN) Madura). Islamuna specializes in Islamic studies which are the results of fieldwork and conceptual analysis research from various perspectives i.e. education, law, philosophy, theology, sufism, history, culture, economics, social and politics. Islamuna has become a CrossRef Member since the year 2015. Therefore, all articles published by Islamuna will have a unique DOI (Digital Object Identifiers) number. This journal, published twice a year in June and December, publishes articles in Indonesian, English and Arabic. As a medium for disseminating and exchanging scientific ideas, Islamuna warmly welcomes contributions from scholars from related disciplines. 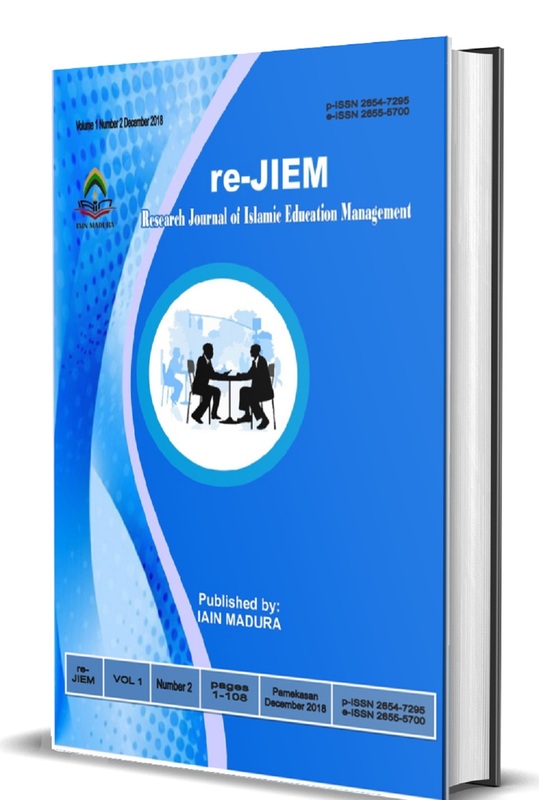 Research Journal of Islamic Education Management (re-JIEM) is a peer-reviewed journal on Islamic education field and intended to communicate original research and current issues on the subject. This journal is published by The Faculty of Tarbiyah, IAIN Madura, in partnership with a non governmental organization. The editors welcome scholars, researchers and practitioners of Islamic education around the world to submit scholarly articles to be published in this journal. All articles will be reviewed by experts before accepted for publication. Research Journal of Islamic Education Management (re-JIEM) has become a CrossRef Member since the year 2018. Therefore, all articles published by re-JIEM will have unique DOI number. 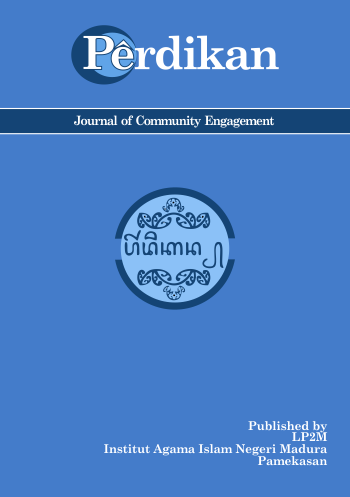 PERDIKAN is a biannual (June and December each year) refereed journal concerned with the practice and processes of community engagement. It provides a forum for academics, practitioners and community representatives to explore issues and reflect on practices relating to the full range of engaged activity. This journal is a peer-reviewed online journal dedicated to the publication of high quality research focused on research, implementation, of policy about community engagement. PERDIKAN is published by LP2M IAIN Madura. This journal provides an opportunity to share detailed insights from different understandings and practices associated with community services. It also provides an international forum for cross-disciplinary exchange of insights and ideas regarding community engagement for dissemination. PERDIKAN will publish the articles to local or international society of practitioners and researchers with interest in community engagement from a wide variety of sectors. Community Engagement means community development, community services, community empowerment, community outreach, and action research. PERDIKAN is an open access journal and free access (and free Registration). The authors can register online on website and not charge any fee from registration process. The authors form university or researched can cite reference from this journal and giving benefits from organization itself.